At Sweet Treat Supply, we’re always looking for an excuse to make something tasty. Since Memorial Day is almost here, what better reason to make a sweet treat than honoring our country and soldiers? 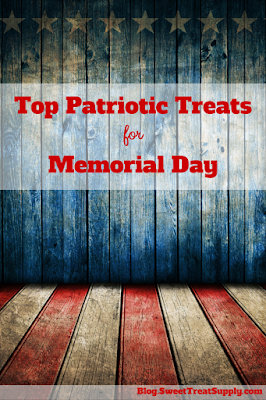 We’ve searched high and low for the tastiest stars-and-stripes sweets and here are our top picks for Memorial Day! Patriotic Lollipops — This has to be one of the easiest and most impressive patriotic treats you could make. Use our How to Make Your Own Lollipops Guide and choose the perfect sucker mold for your party — we’d suggest these big flags or these 3-D stars — and you’ll have a treat that everyone will enjoy. Red, White & Blue Whoopie Pies — Who doesn’t love a good Whoopie Pie? This recipe from NeighborFood Blog uses simple white cake mix, red and blue food coloring and sprinkles to get everyone in the holiday spirit. As an added bonus, these don’t take too much work, and they don’t require any special equipment. It’s a win-win for everyone. Patriotic Cake Pops — This simple cake ball recipe relies on package cake mix, icing and chocolate melts to save you time. If you’ve never made cake balls before, Memorial Day is the perfect day to try it out, and you’ll love how easy this recipe makes it! To up the Wow Factor with your presentation, arrange the cake balls to look like a flag, dotting the blue balls with nonpareils and adding stripes of frosting to the red cake balls. Red, White & Blue Rice Krispy Treat Pops — An easy way to make treats for a crowd, these rice krispy treat pops are one of our go-to recipes for any holiday. Red, white and blue are most appropriate for Memorial Day and the 4th of July, but save the recipe and change the colors to orange and black for Halloween or red and green for Christmas. Jello Firecrackers — The cute and jiggly way to celebrate America, these Jello firecrackers are sure to be a hit at any party. Layer blueberry, unflavored and cherry gelatin in a plastic shot glass and stick a maraschino cherry on top as your fuse, and you’ll have these adorable and tasty treats ready in no time! Red, White & Blue Chocolate Dipped Oreos — This fun patriotic dessert only requires a few ingredients: Oreos and red, white and blue chocolate melts. Start by completely covering the Oreos in white chocolate. Let the chocolate set, and then dip one third in blue chocolate and one third in red chocolate for a cute and quick treat the whole family will devour. What’s your favorite treat to make for patriotic holidays? Let us know in the comments below!